Contrary to popular belief, wheel locks on wheelchairs are not brakes. Brakes would be used to slow down and stop a wheelchair but that is not the purpose of wheel locks. Wheel locks are more like parking brakes; designed to keep the wheelchair in place when waiting or transferring in and out of the wheelchair. These wheel locks are the industry standard on most wheelchairs. They come in either a push to lock version, meaning the user pushes to lock the wheels, or pull to lock, meaning the user pulls to lock the wheels. These wheel locks are located on the top side frame rail in front of each rear wheel. 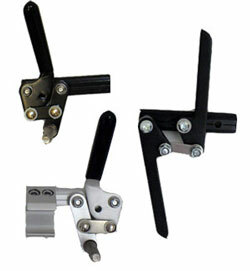 Scissor lock brakes are chosen on the sportier wheelchairs for very active users. These wheel locks are mounted on the top rail of the side frame of the wheelchair however when not in use are completely under the seat. Very active users who propel their wheelchairs quickly have been known to damage their hands on the push/pull to lock wheel locks because of their close proximity to the wheels. These scissor locks solve this issue by being well out of the way when the wheelchair is being propelled. Foot lock wheel locks are only available on tilt wheelchairs with non-folding frames. Foot locks are not accessible to the wheelchair user and for the use of the caregiver. They are mounted below the back of the seat on the lower side rail bars and each brake is connected to a center brake lever that most people use their foot on.